School Internet Safety – TEKHELPER – Managing your technology so you can take care of business! As a provider of managed IT services to schools, school internet safety is a top priority for us as well. We often work with school staff to protect children from inappropriate content online, by employing sophisticated content filtering techniques. The challenge is that, content filters need to be intelligent enough to shield the kids from inappropriate sites and content but still allow access to resources that are educational. Content filtering though, needs to be coupled with a strong in-school program to educate children on how to safely use the internet. 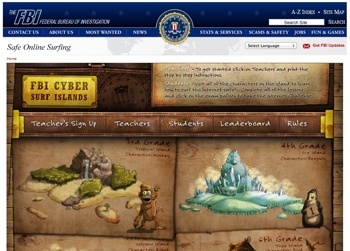 To that end, the FBI has setup a new website, Cyber Surf Island to provide resources to school teachers and students to promote internet safety in school and among children in general. The website takes the form of a playable game that engages students from Grades 3 to 8 to actively learn about cyber-bullying, virus, spyware and other nasties as well as internet predators. Accounts on Cyber Surf Island need to be setup up by the School’s technology instructors and assigned to the children, who can then login to access the site even from home. The FBI has cleverly added a competitive element to keep the children engaged by challenging students with education in the form of a game. Schools may also compete against each other with a points-scoring system. The winning school then receives a visit from a real FBI agent. How cool is that – that should surely keeps the kids motivated. Head over to Cyber Surf Island at https://sos.fbi.gov/ to check it out. Certainly, a very praise-worthy initiative! Parents may also want to visit the FBI Kids Safety page with their children to review prudent internet behavior.